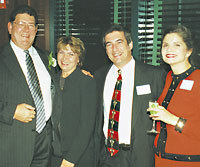 Joining the festivities with Gracey were, from left, Mary Ellen Geoffroy, manager of business development at NIC Commerce of Reston, Va.; Barry West, agency expert for information assurance at the General Services Administration; and Rita Joseph, vice president of public solutions for Autonomy Inc. of San Francisco. Veterans Affairs Department systems chiefs past and present were among those honoring and roasting Harold F. Gracey Jr., right, at a dinner in McLean, Va. Gracey recently retired as VA's chief information officer. Greeting him are Robert J. 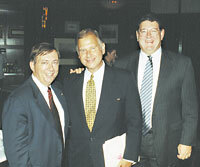 Woods, left, president of business applications solutions at ACS Government Solutions Group Inc. of Rockville, Md., and a former VA systems chief, and Robert Bubniak, acting VA systems chief. 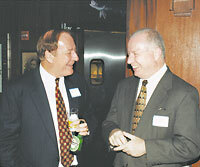 Reed Phillips Jr., left, of SRA International Inc. of Arlington, Va., greets CIO S.W. 'Woody' Hall Jr. of the Customs Service. 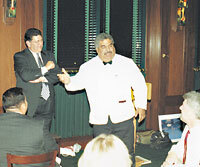 rousing 'For He's a Jolly Good Fellow''is an opera singer-turned waiter. Looking on at left is Philip Fuster, president of Fedbid.com of Germantown, Md., where Gracey now works.